A stylized black cat graces the front of this black PU Leather round shoulder bag. An irresistible round, black purse-shoulder bag, with a strikingly alternative, iconic image boldly embossed upon its front to personify the wearer's alter ego. Bag is made in PU leather with a zip opening across its top edge and is fitted with a metal curb chain and comfort panel shoulder strap. Bag measures 7.09 inches in diameter and 2.36 inches deep. Item Number: AG-GB8 | Approximate Size (Inches): 7.09 wide x 2.36 deep x 7.09 high | Approximate Shipping Weight: 1.50 lbs. US Standard Shipping Made in the UK, it ships from Alchemy Gothics US Warehouse in Texas. Transit time for instock items are 1-4 business days, however, not all items and sizes are in stock at all times. Items which much be shipped from the UK will take 5-10 business days. 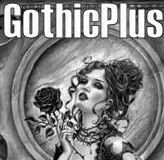 US Express Shipping Made in the UK, it ships from Alchemy Gothics US Warehouse in Texas. Transit time for instock items are 1-2 business days, however, not all items and sizes are in stock at all times. Items which much be shipped from the UK will take 5-10 business days. International Delivery Made in the UK, it ships to our warehouse in Florida (about 4 days). We ship to you via US Priority Mail. Average delivery time is 2-10 business days but will vary with customs in your country. Import duties or fees may be required before delivery is made - contact your local customs office for details. PO Box/APO/Military Delivery Made in the UK, it ships from Alchemy Gothics US Warehouse in Texas. Transit time for instock items are 1-4 business days, however, not all items and sizes are in stock at all times. Items which much be shipped from the UK will take 5-10 business days. Warranty All Alchemy Gothic pieces have a lifetime guarantee against defects and faulty workmanship. In the unlikely event that you should have any such problems, please return them to LABEShops for repair or replacement. With normal wear, your piece should last a lifetime, but do not excessively bend or flex pewter as it can break and such breakage is not covered under warranty.